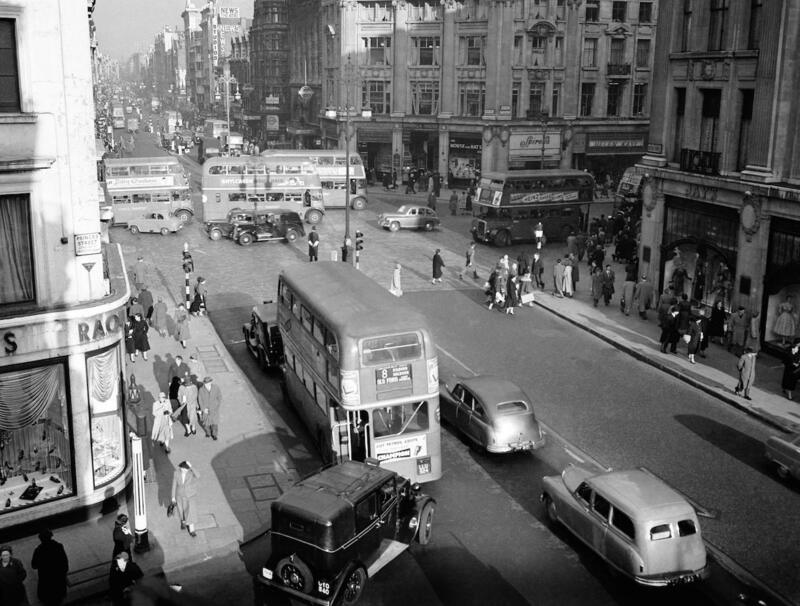 Oxford Street, long before it became part of the A40, was once part of a Roman Road called Via Trinobantina which linked Silchester and Colchester via London. 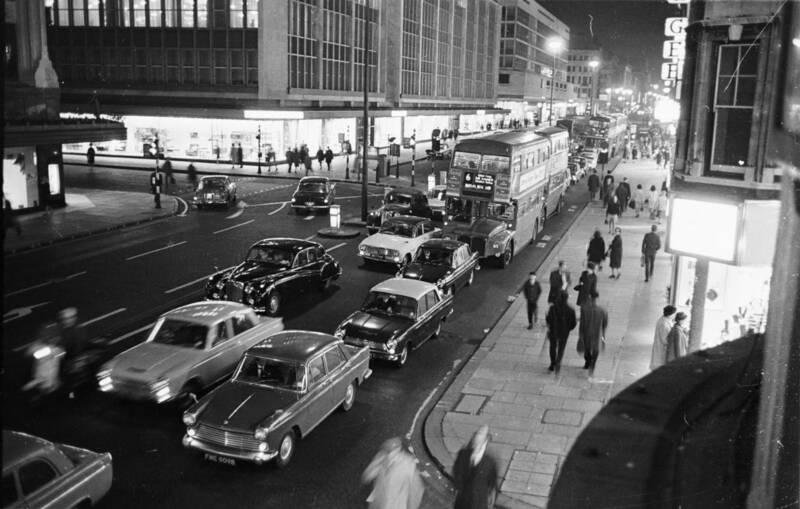 Oxford Street, long before it became part of the A40, was once part of a Roman Road called Via Trinobantina which linked Silchster and Colchester via London. 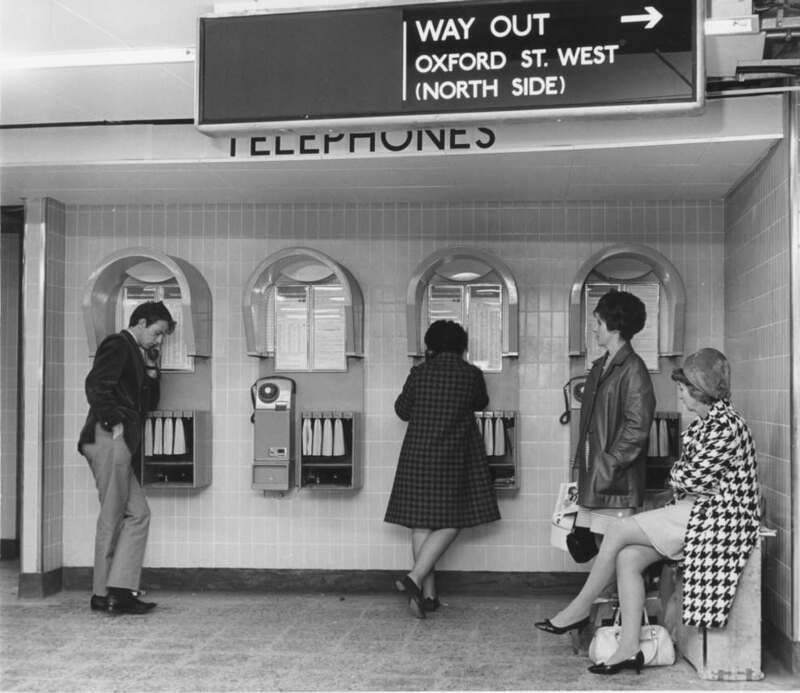 Between the 12th Century and into the 18th Century it was known variously as the Tyburn Road (named after the Tyburn river which ran just south of it and now flows underneath Oxford Street), Uxbridge Road, Worcester Road and Oxford Road. 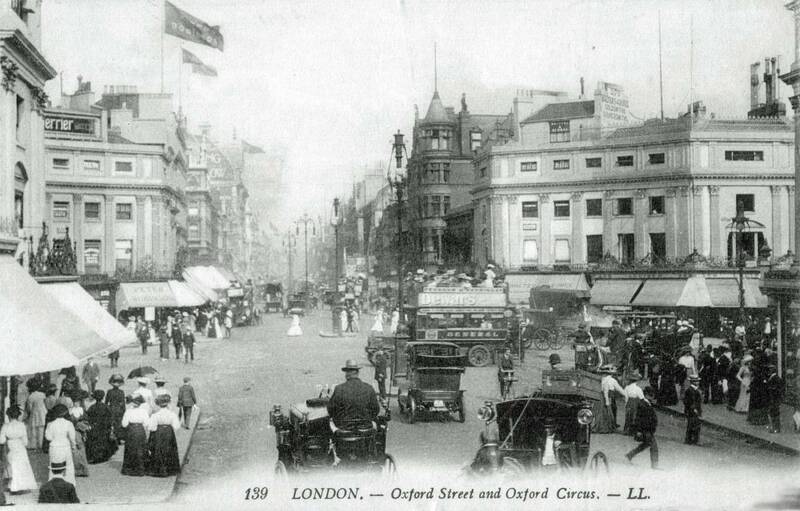 By 1730 the road became known as Oxford Street. 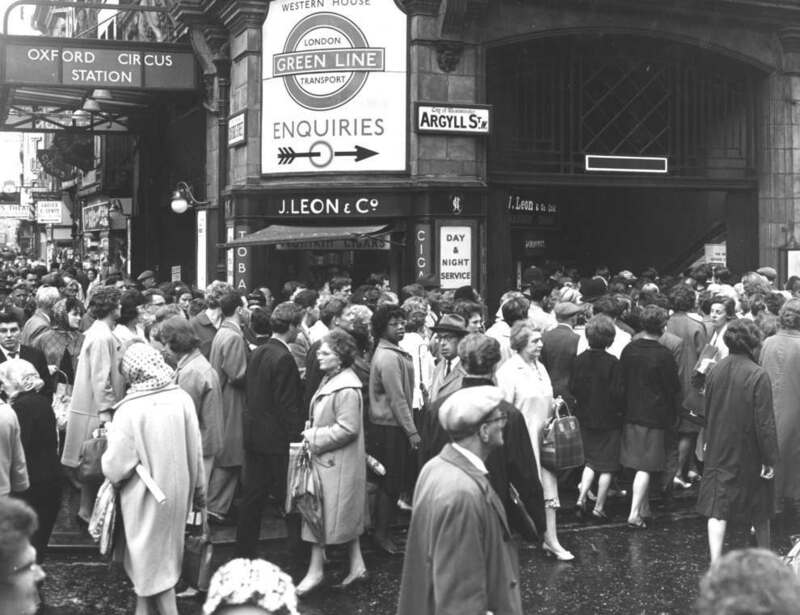 The street became popular with entertainers including bear-baiters, theatres and public houses. 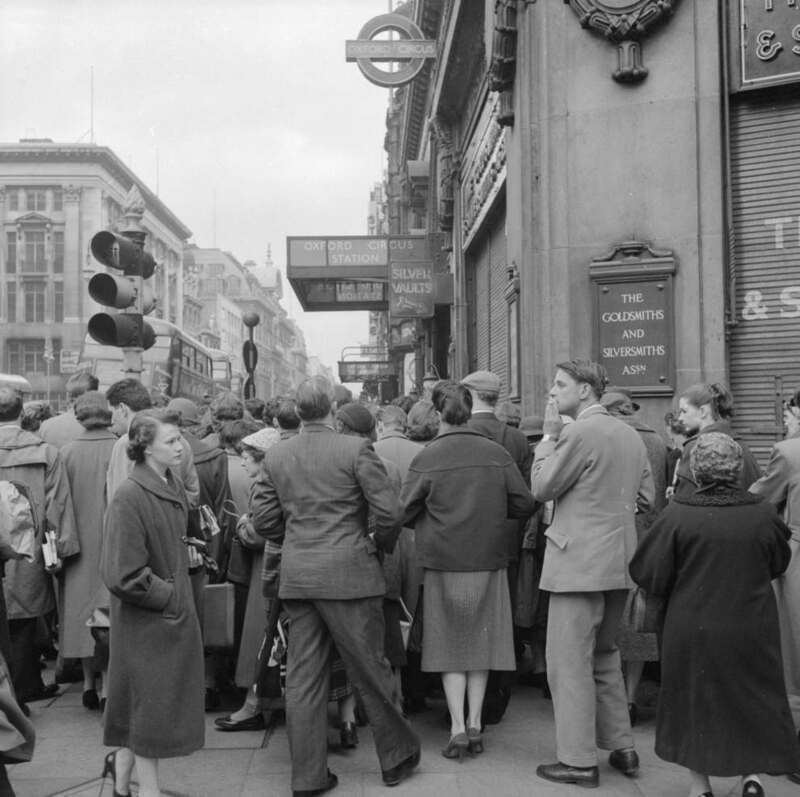 It was place shunned by the middle and upper classes due to the nearby Tyburn gallows and St Giles (the area around the junction of Oxford Street, Charing Cross Road and Tottenham Court Road), then a notorious ‘rookery’ or slum. 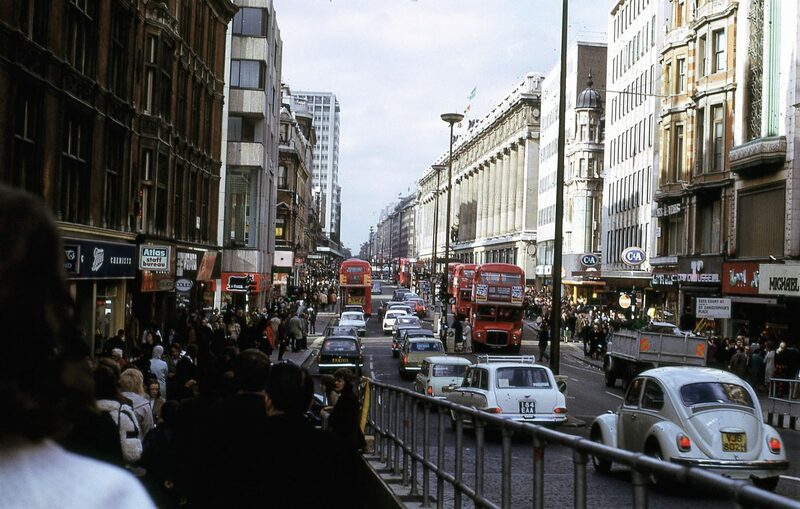 The gallows were removed in 1783, and by the end of the century, Oxford Street was being built up from St Giles Circus in the east to Park Lane on the west, containing a mix of residential houses shops and theatres. 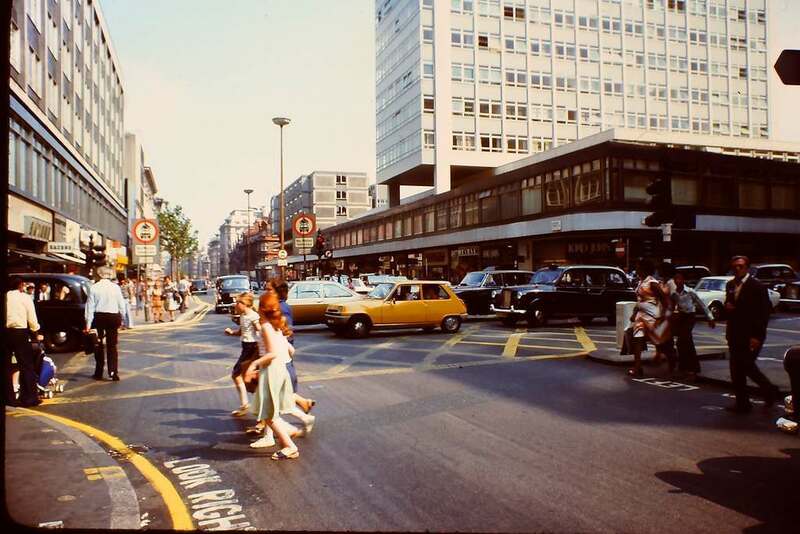 Stanley Green, Oxford Street in 1974. Photo by Sean Hickin. 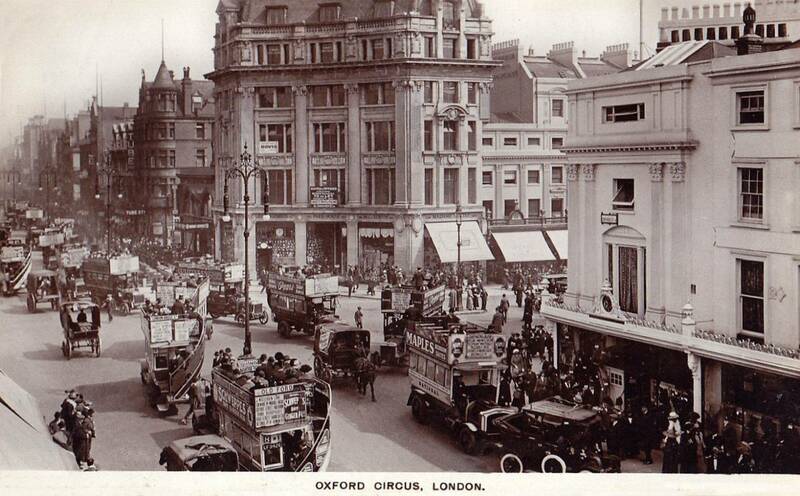 1972, courtesy of Glen F.
Postcard of New Oxford Street in 1903. 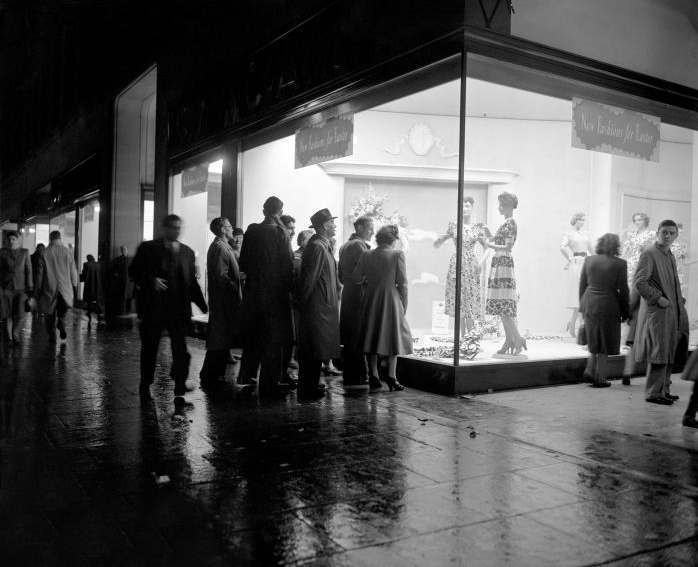 John Lewis started in 1864 as a small shop at No. 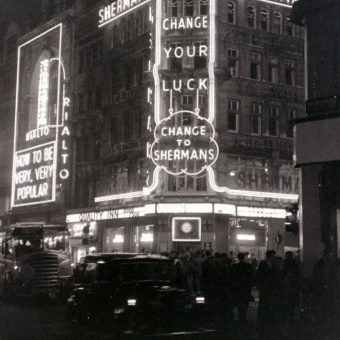 132, while Selfridges opened on 15 March 1909 at No. 400. 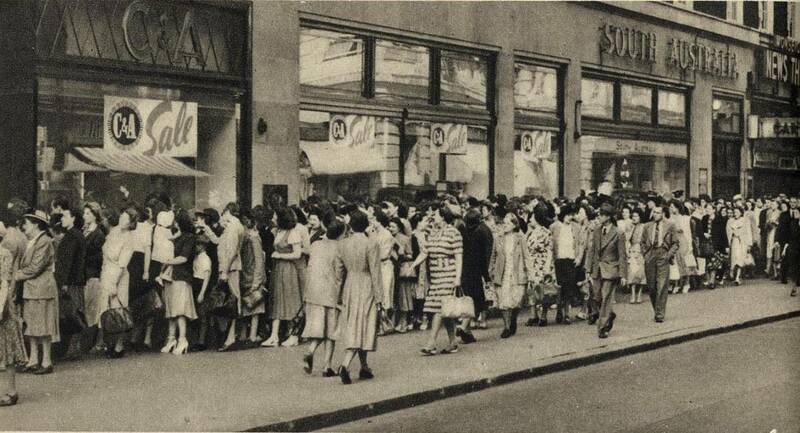 By the 1930s, the street was almost entirely retail, a position that remains today. 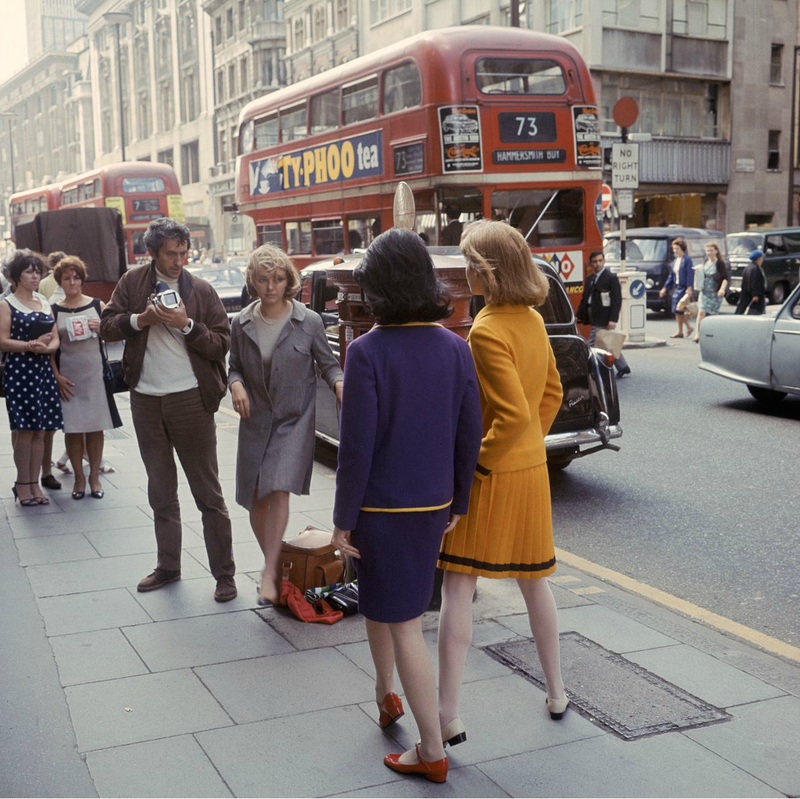 However, unlike nearby streets such as Bond Street and Park Lane, there has remained to this day a slightly seedy element that can never quite be shook off. 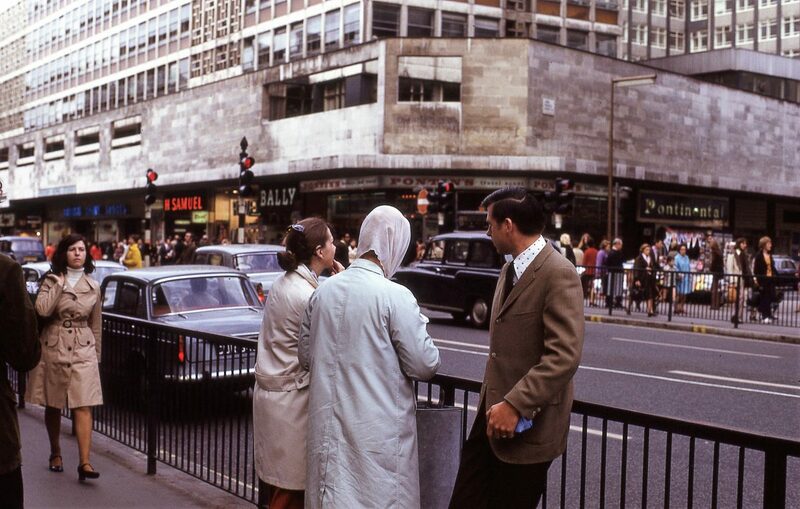 Oxford Street in 1976, by Klaus Hiltscher. 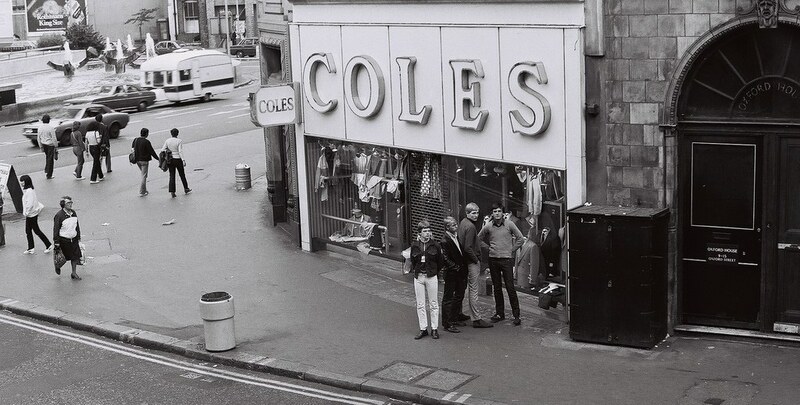 Oxford Street in 1976 by Klaus Hiltscher. 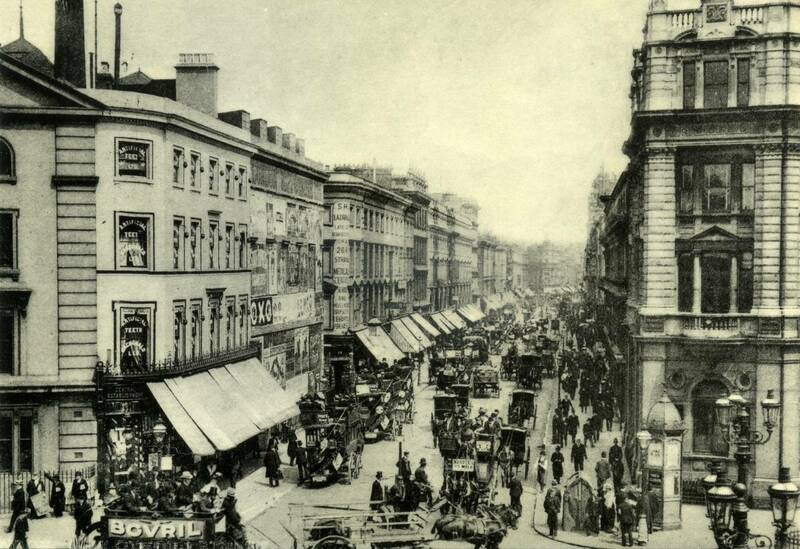 Oxford Street, London, 1887. 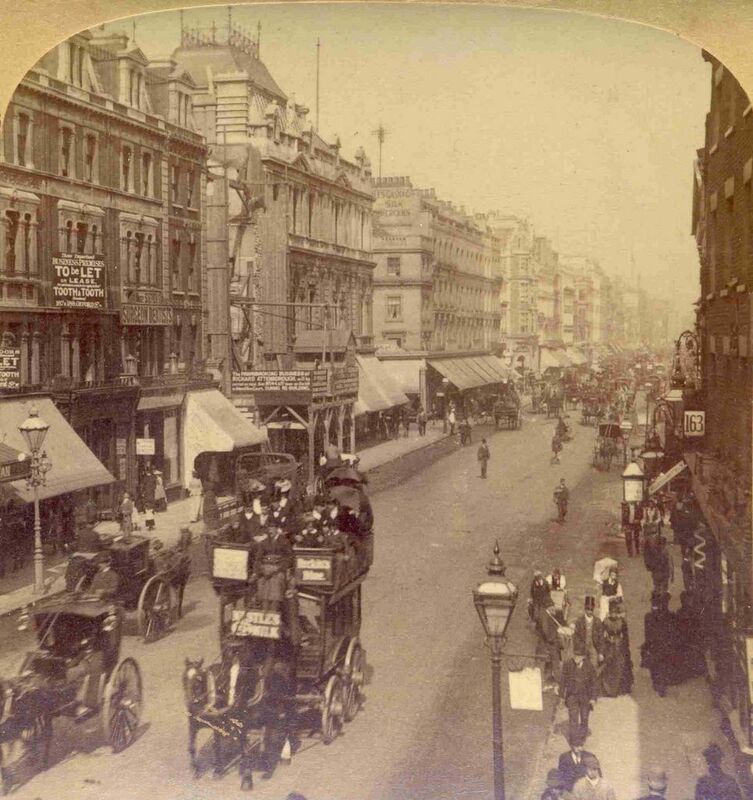 A stereoview image published by J.F. Jarvis and sold by Underwood & Underwood. 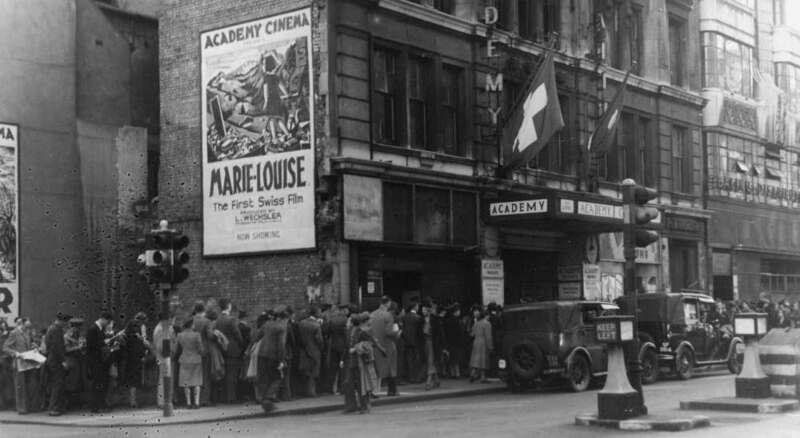 The Academy Cinema in Oxford Street, 1945. 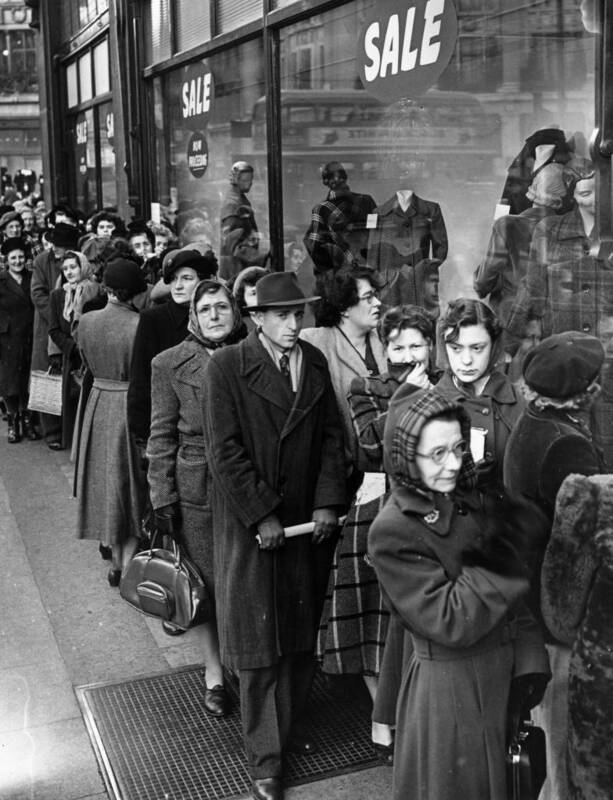 Queue at C & A department store, Oxford Street, 1950. 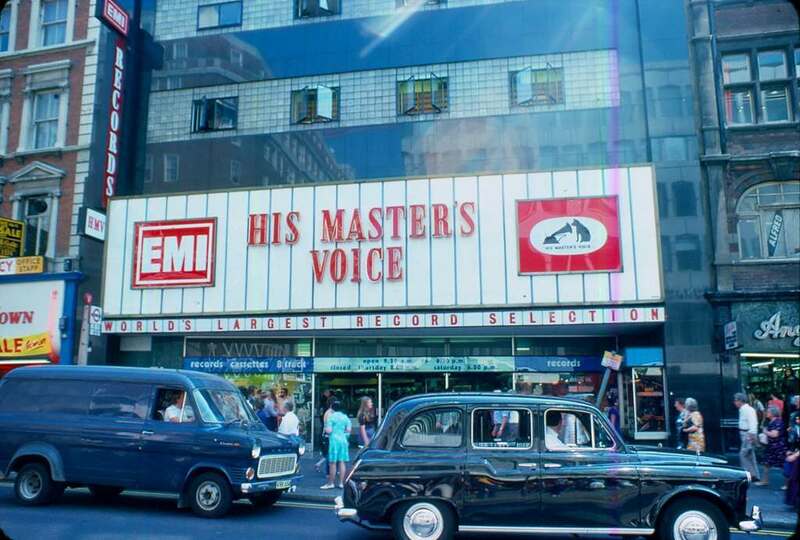 The HMV store on Oxford Street, 1976. 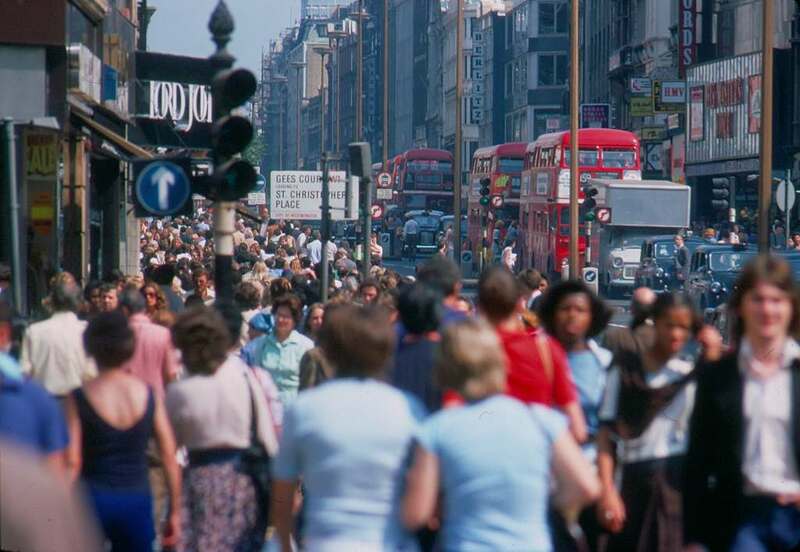 Oxford Street Charing Cross Road, 1982. 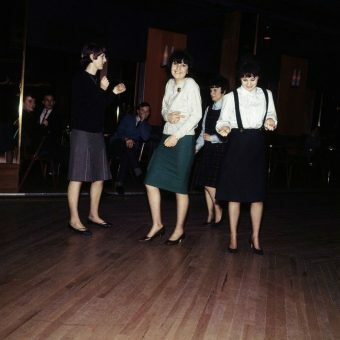 By Peter McGowan. 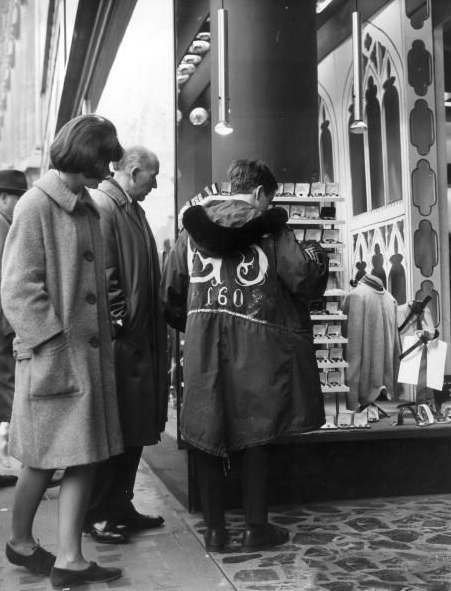 Mod in Oxford Street, 29th Dec 1964. 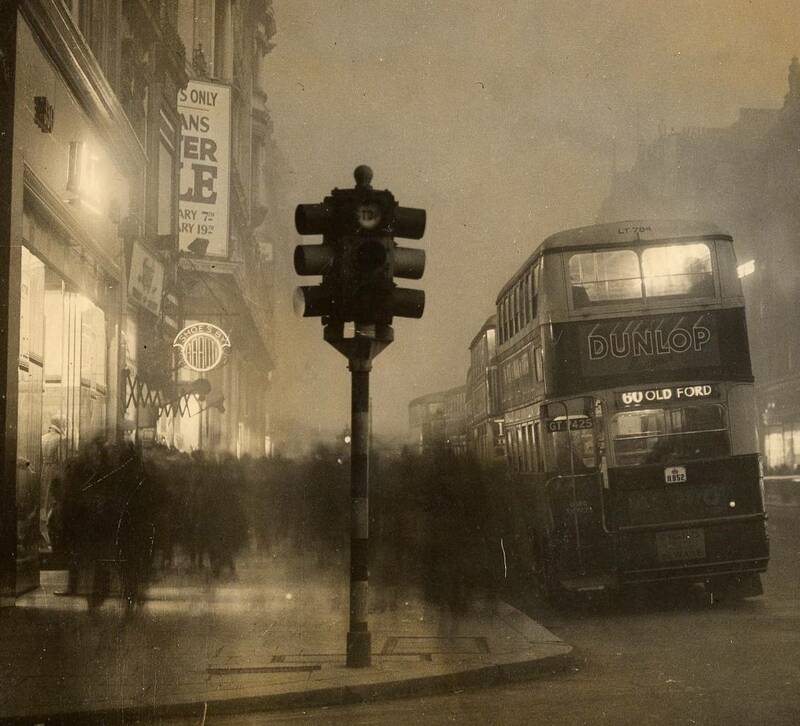 Oxford Street, 1940. 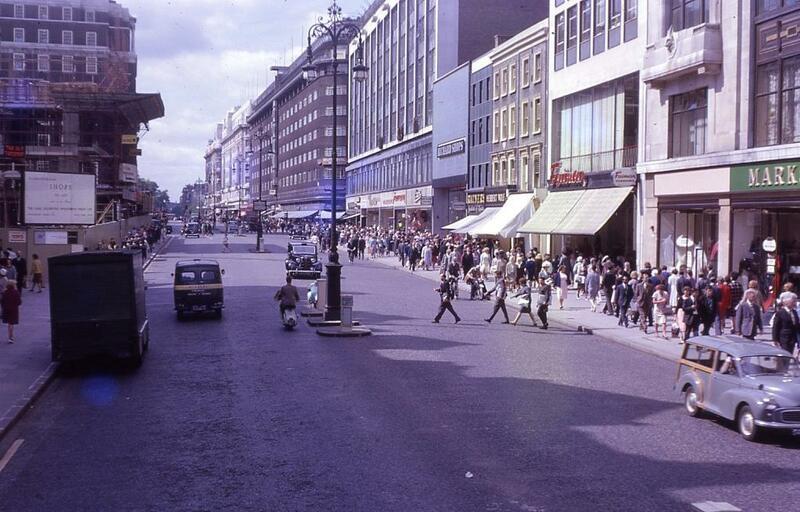 What’s left of John Lewis on the left. 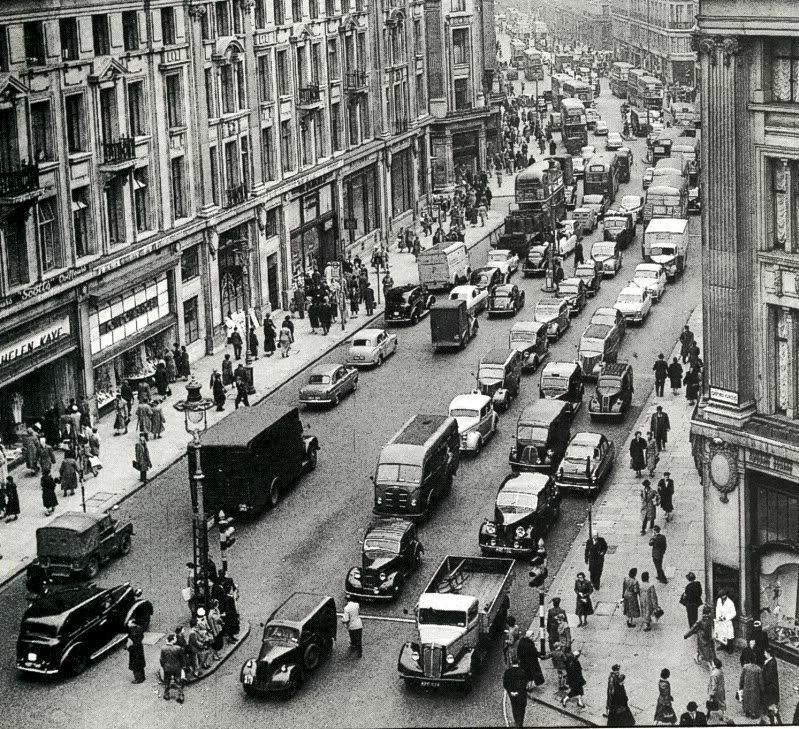 Oxford Street suffered not inconsiderable damage during the Second World War. During the night and early hours of 17 to 18 September 1940, 268 Heinkel He 111 and Dornier Do 17 bombers targeted the West End, particularly Oxford Street. 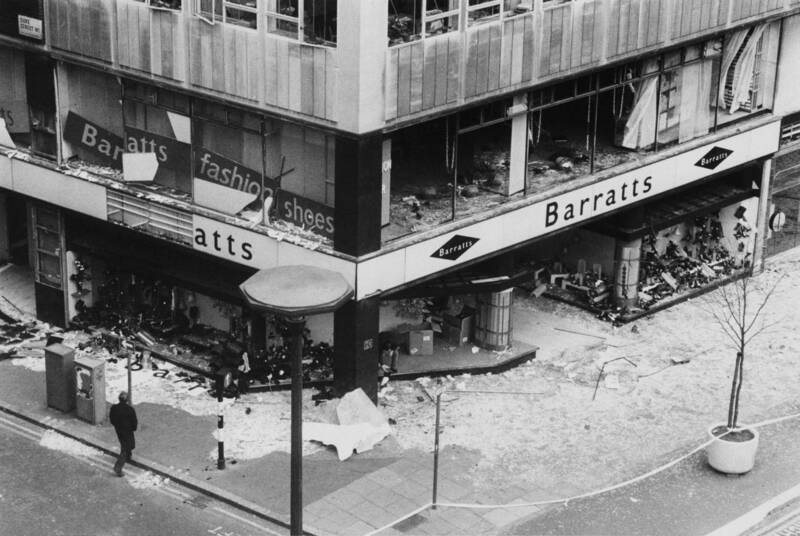 Many buildings were damaged, either from a direct hit or subsequent fires, including four department stores: John Lewis, Selfridges, Bourne & Hollingsworth and Peter Robinson. 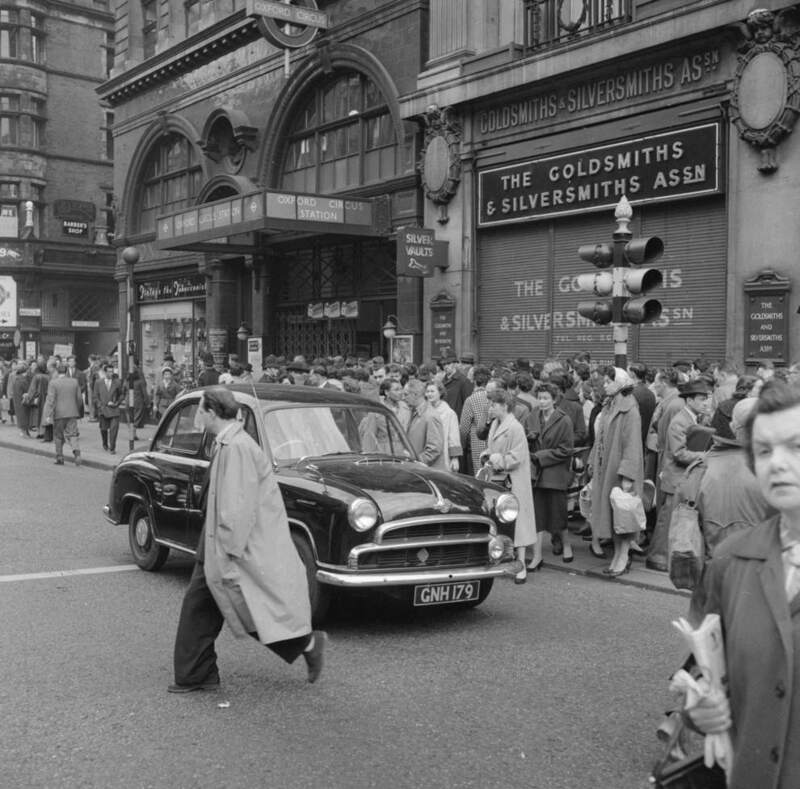 George Orwell wrote in his diary for 24 September that Oxford Street was “completely empty of traffic, and only a few pedestrians”, and saw “innumerable fragments of broken glass”. 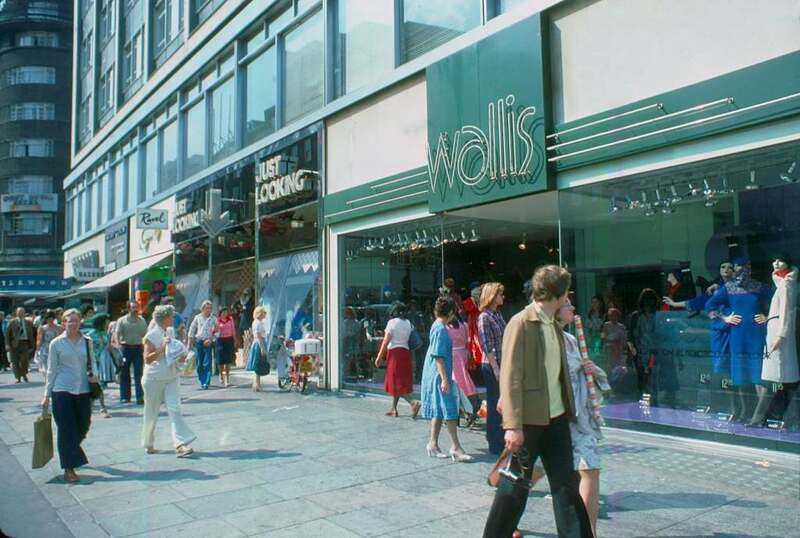 John Lewis caught fire again on 25 September and was reduced to a nothing but a shell. 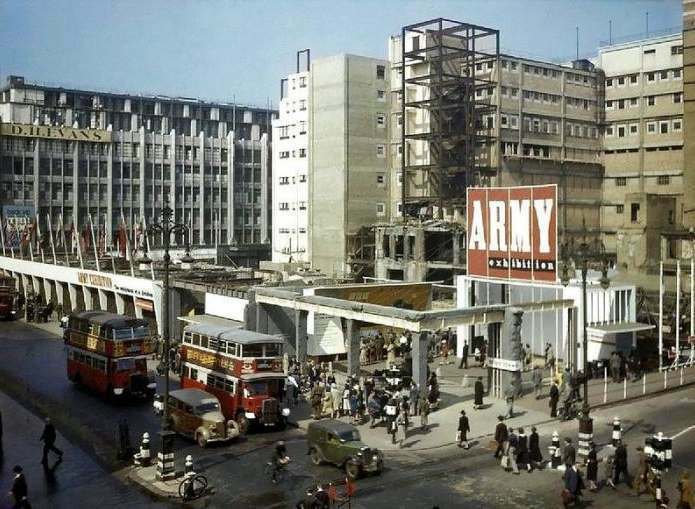 It remained a bomb site for the remainder of the war and beyond, finally being demolished and rebuilt between 1958 and 1960. Peter Robinson partially reopened on 22 September. 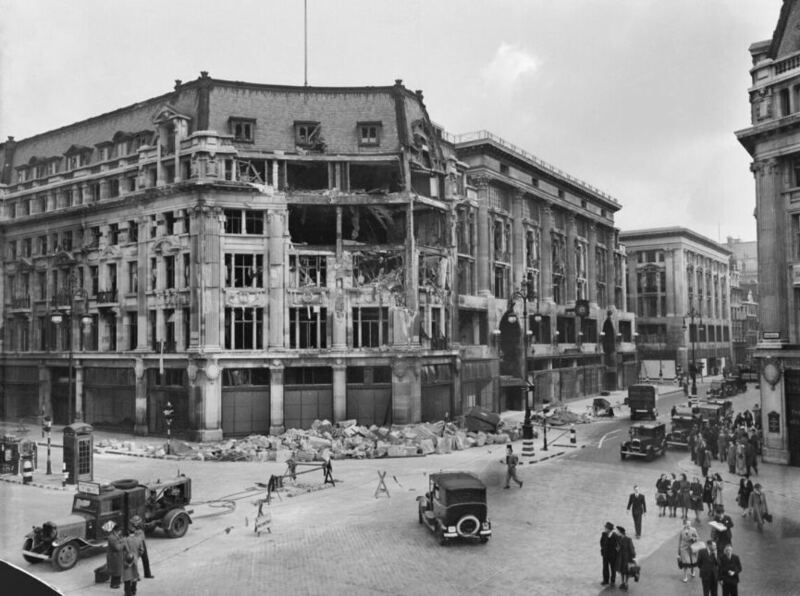 Selfridges was bombed again on 17 April 1941, suffering further damage, including the destruction of the Palm Court Restaurant. 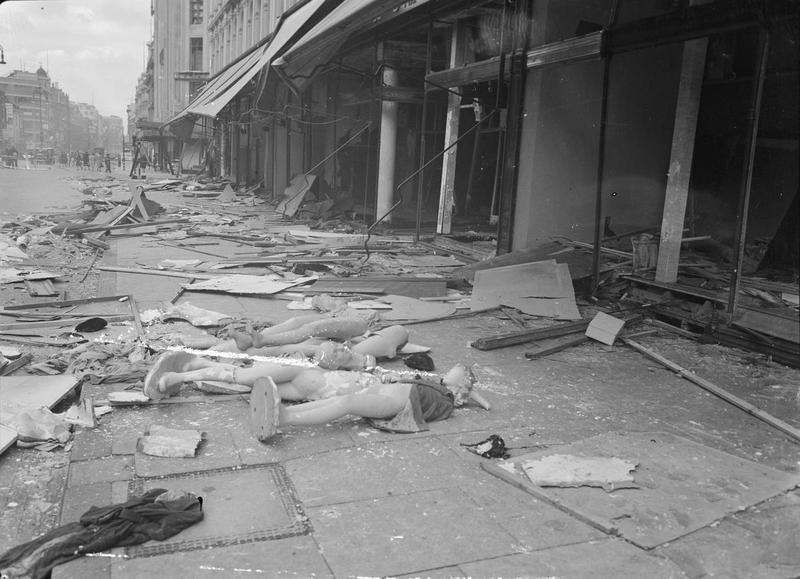 The store was damaged yet again on 6 December 1944 after a V2 rocket exploded on nearby Duke Street. 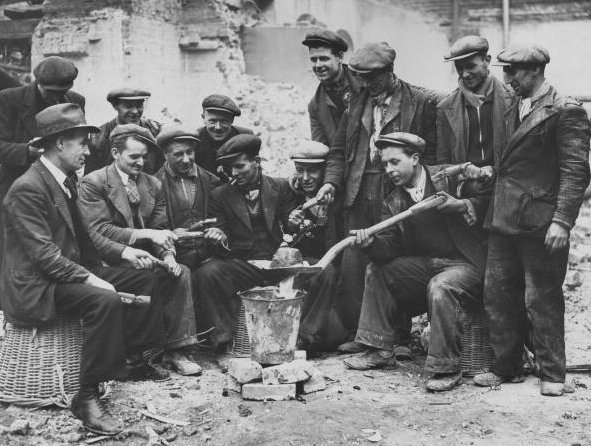 20th December 1937: Workmen demolishing the Pantheon in Oxford Street, London, warm up a Christmas pudding. 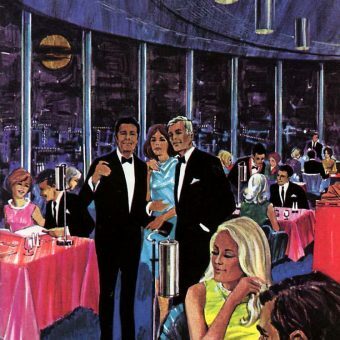 By Reg Speller. 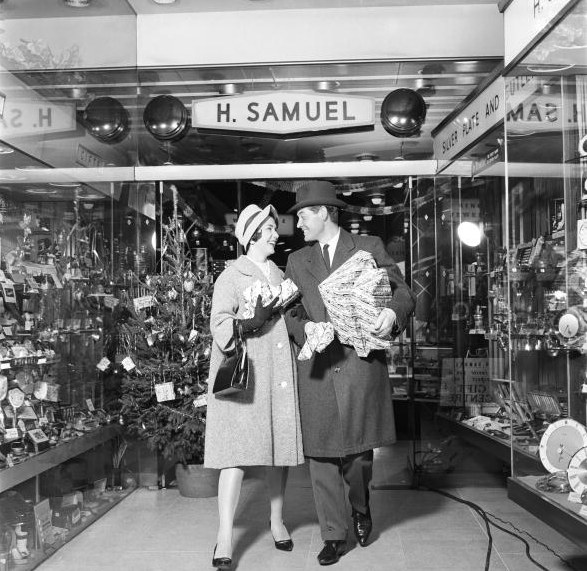 H. Samuel in Oxford Street 1960. 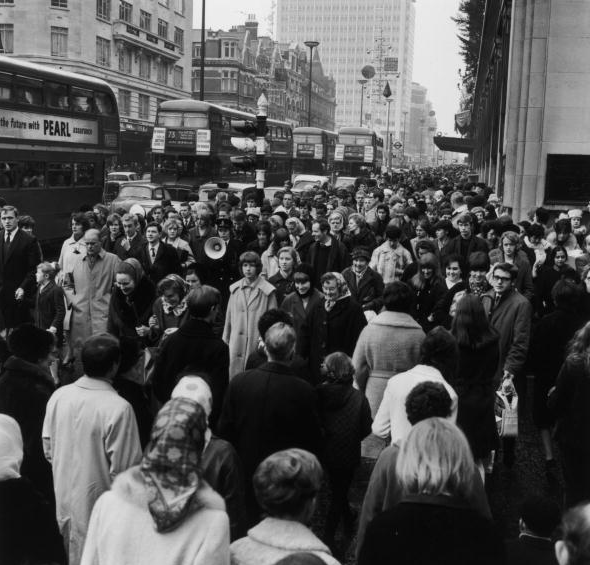 Christmas shoppers in Oxford Street 1964. 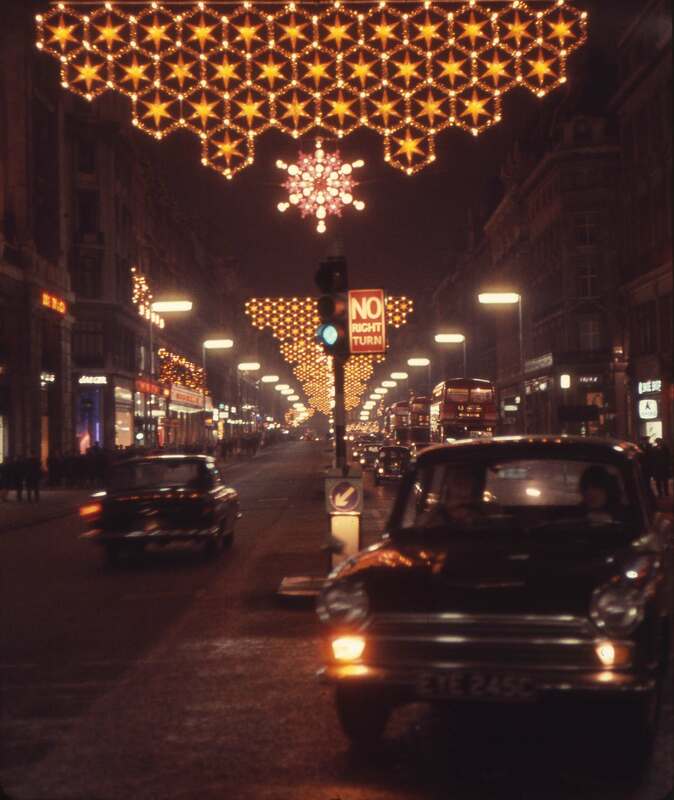 Oxford Street, London, Christmas Eve, 1965. 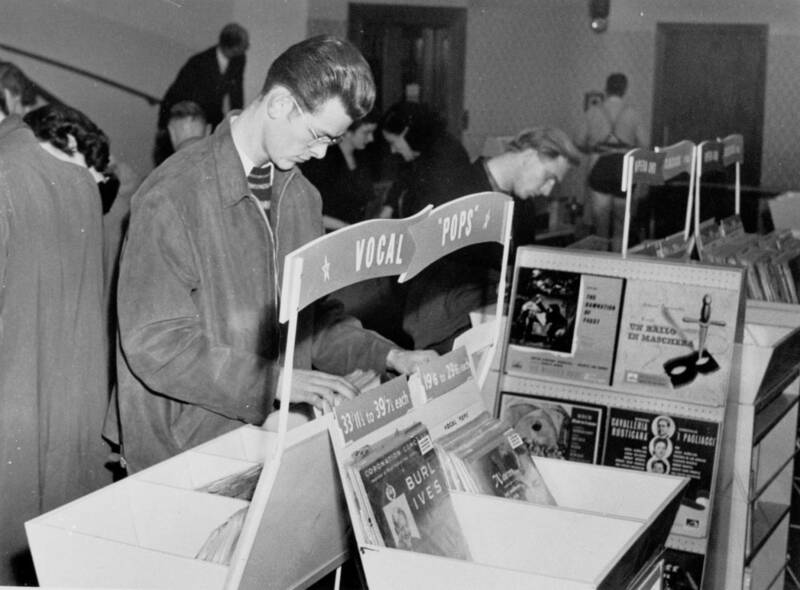 HMV, 363 Oxford Street, London – Customer browsing records 1950s. 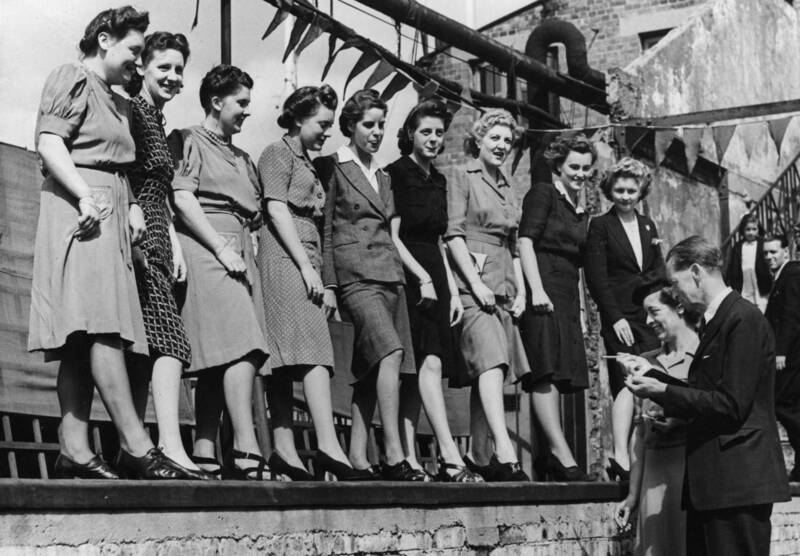 My first paid job was delivering newspapers. 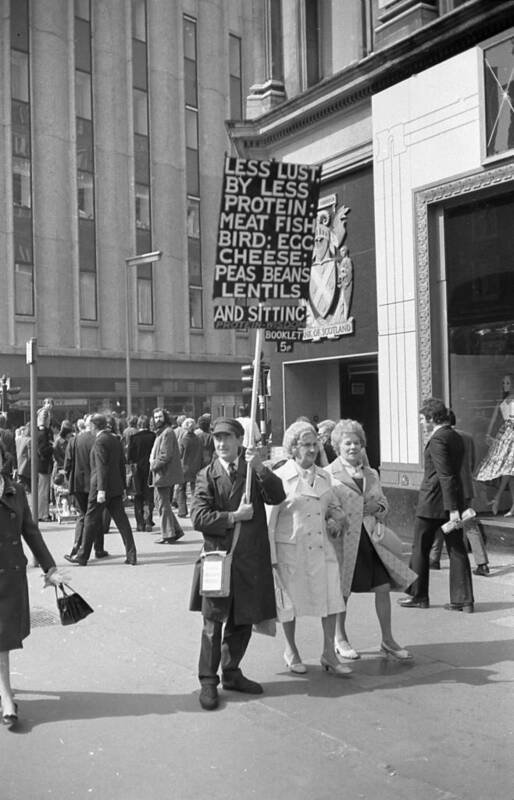 The first paid acting job I got was dressing up as Edam cheese and handing out leaflets on London’s Oxford Street. I got pushed over by these little herberts and given a good shoe-in. 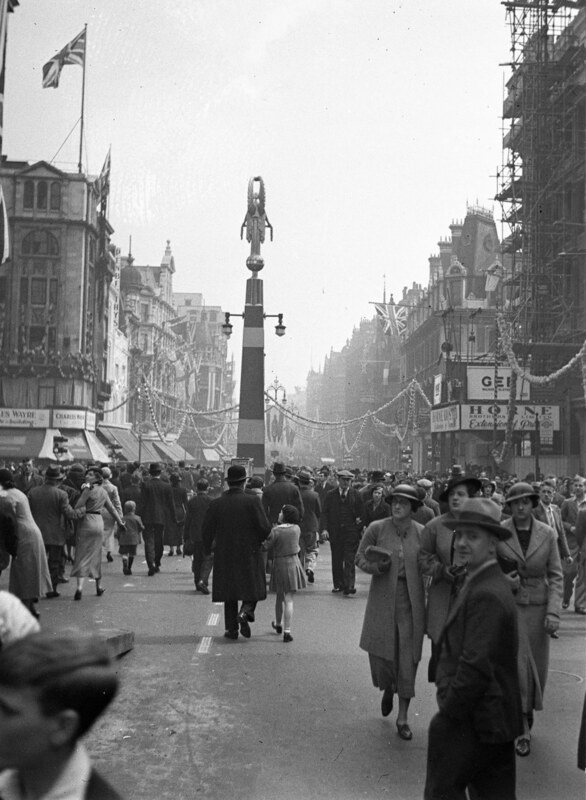 London Oxford Street, 1935 Jubilee. 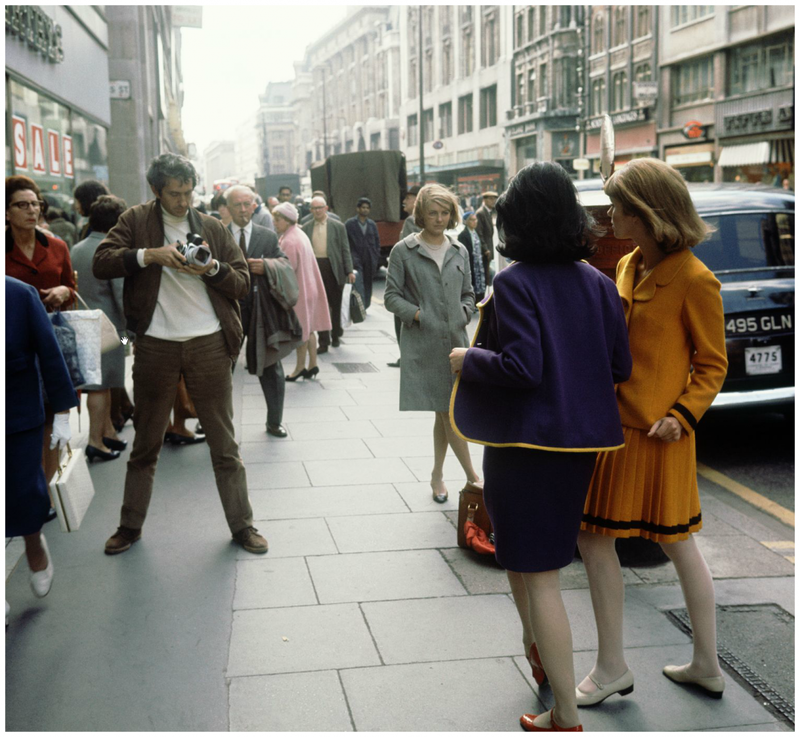 Oxford Street, 1966, Paul Huf working on a fashion shoot for Avenue. 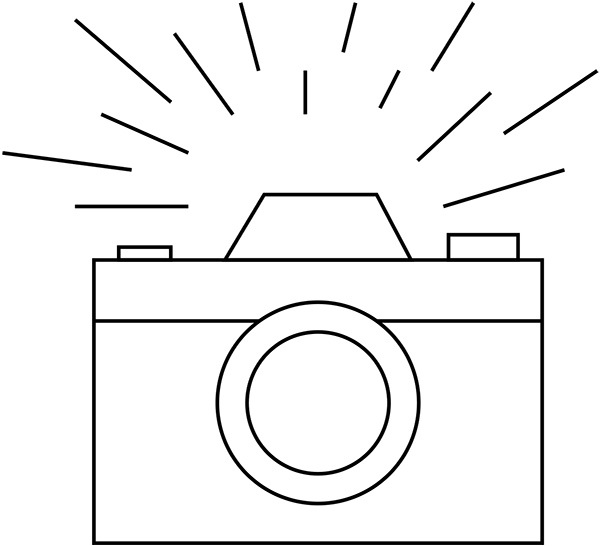 Photo by Sem Presser. 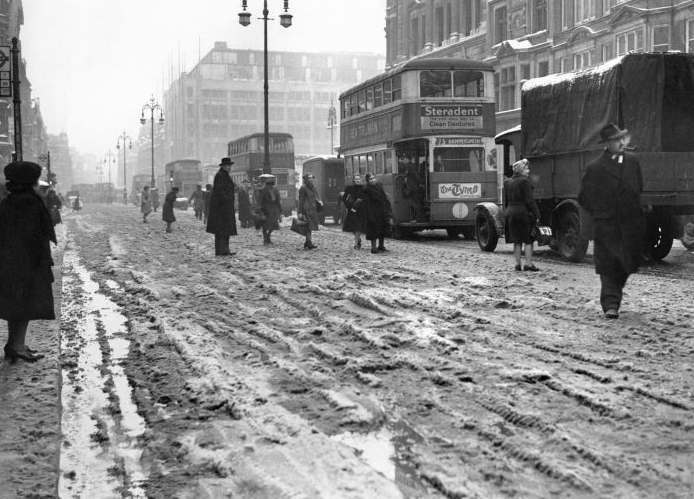 Oxford Street, devestation outside the John Lewis store, 1940. 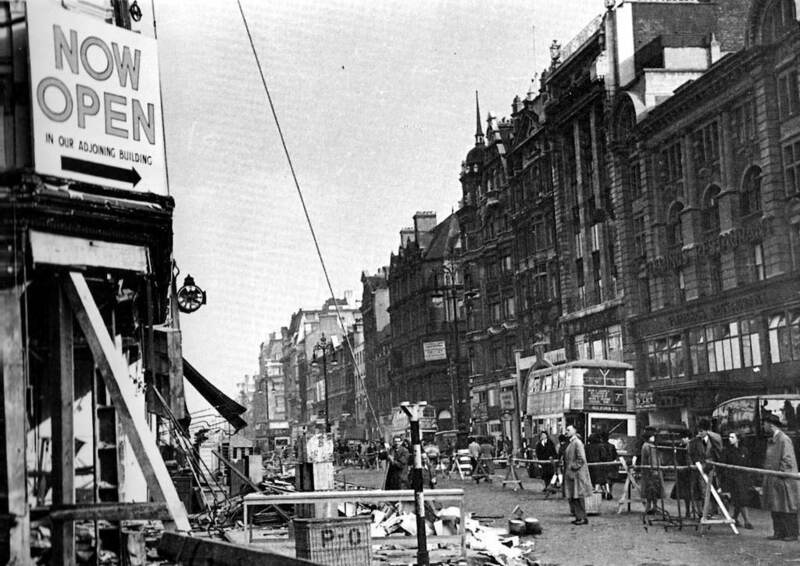 Bombed out John Lewis, 1942. 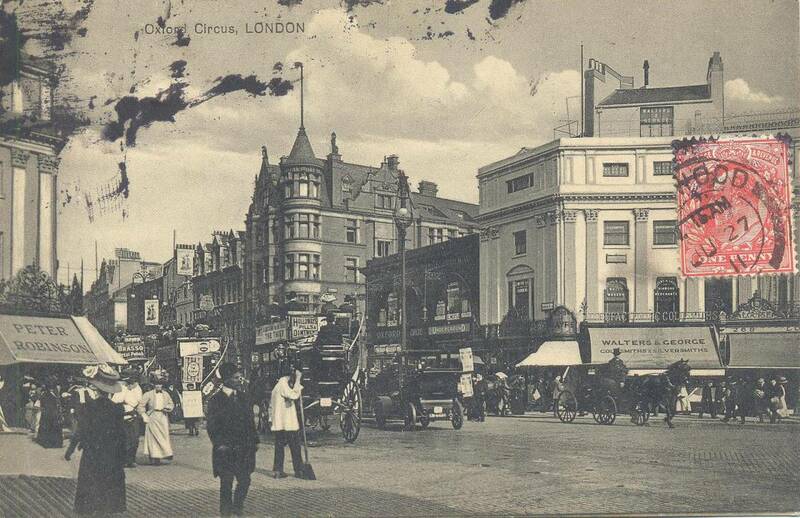 Louis Levy postcard from about 1904 Oxford Circus towards New Oxford Street. 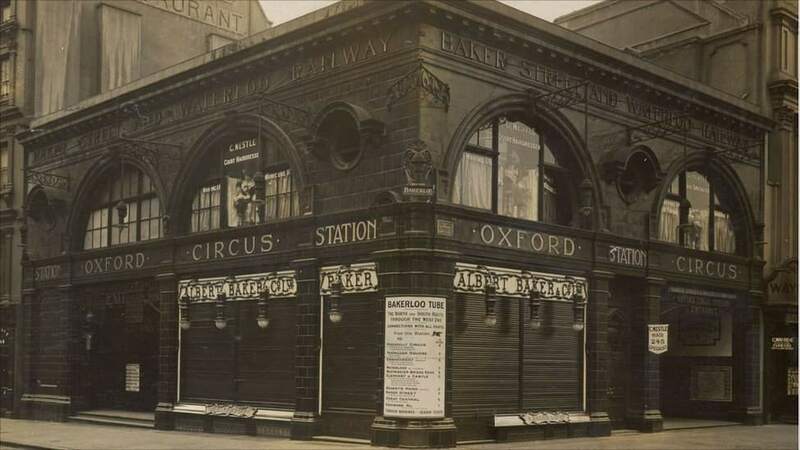 Oxford Circus tube station, 1906. 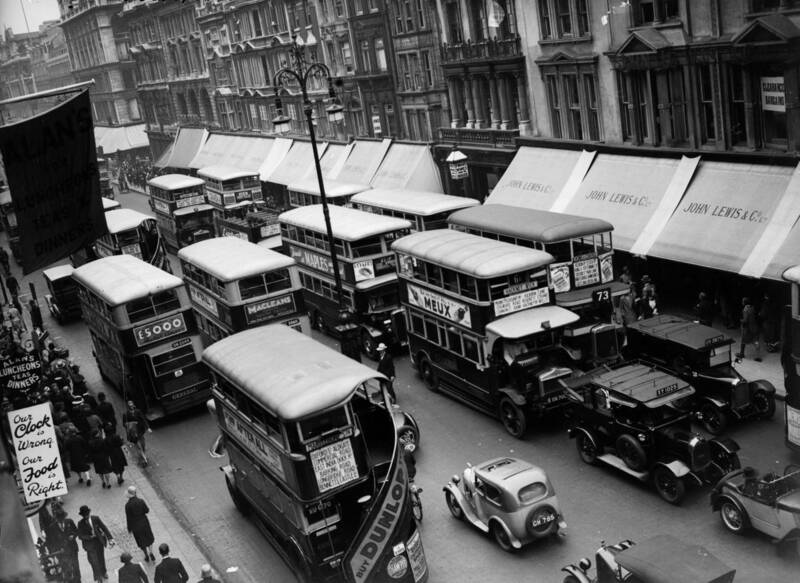 Peter Robinson department store Oxford Circus 1940.